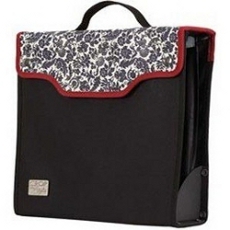 Crop-In-Style has wonderful Scrapbook Storage Binders and Totes and were, I believe, the first company to make Scrapbook Storage items designed by a Scrapbooker for other Scrapbookers. The Original PSB - Paper Sticker Binder by Crop-In-Style is a Standard 3-Ring Binder with several types of clear refill pages to house and protect paper and embellishments from getting bent or torn. The Storage Binder itself includes refill pages. It has secure a zip closure and enough room inside so you won't bend the corners of your papers. It also has interior and 6 exterior pockets to tuck away a bunch of special items. The outside dimensions of the Scrapbook Storage Binders are 14.00" high x 2.40" wide x 15.50" long and weighs in at 3.26 pounds. The PSB's are designed to fit into all Crop In Style tote organizers and are great for home storage and for taking to crops with enough capacity to provide you a wonderful selection of paper-crafting supplies anywhere you go. When you order the Paper Binder you will receive 6 refills to hold 12 x 12 paper and 2 called Standard Strip to hold 5 12 inch sticker strips. These refills can also be purchased separately in a package of 10 clear sheets. Each pocket of the refill has a flap on the top for easy access and secure closure so that when you turn your binder upside down, the strips will not fall out. Other Paper Binder refills are available with clear sheets divided into 16 compartments to hold smaller stickers and die cuts, others to hold 6 page toppers, others dividing the space into 2 compartments of 6 x 12 called Wide Border another with 5 compartments of 5 1/2 inch called Chunky Refill Pack and still others that divide the space into 4 compartments of 4 x 6 inch called Quarter Refill Pack - great for holding photos. Multi-Packs are also available with 9 mixed sheets, the Mega Refill Pack with 15 mixed refill sheets and the Addict Refill Pack with 21 Assorted Pages for the Paper/Sticker Binder. The Addict Refill Pack contains the following:3 Standard Pages - with 20 pockets perfect for small stickers and die-cuts. 3 Quarter Pages - with 4 pockets for holding larger sized stickers and die-cuts. 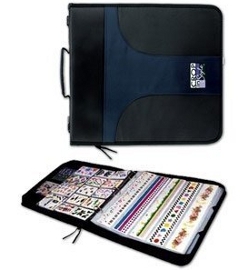 3 Wide Border Pages - with 2 pockets great for wide border stickers and long die-cuts. 3 Chunky Pages - with 5 pockets made medium sized stickers and die-cuts. 3 Standard II Pages - with 10 various sized pockets for holding odd shaped stickers and die-cuts. 3 Strip Pages - with 5 long pockets for 12" strip stickers and rulers. 3 12x12 Pages - To safely transport pages items and finished pages home from crop parties. I actually have purchased 4 of these Scrapbook Storage Binders over the years, and have one in Black, Navy, Green and Purple. They wear very well. I purchased the first one back in 2000 and I can't tell which one is the oldest. Our Scrapbook Storage Binder Store below has a selection of Crop-In-Style Items related to the Paper Sticker Binder that I am sure you will enjoy using in your Craft Area. Use the scroll bar at the bottom of the Recipe Scrapbook Store to scroll to the right and see your Amazon Wish List; search for other products; or see product reviews. you are actually purchasing from Amazon.com. for ideas to help with all your Storage needs.